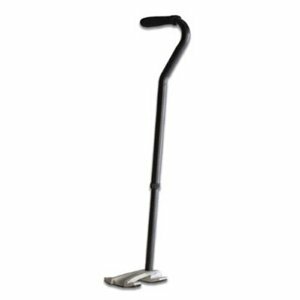 Competitive Edge Products is delighted to present the brilliant Lifetime Products Lifetime Tru-Motion Walking Cane # 1011, Black with Silver base, Black/Silver, 1011. This walking cane is lightweight, simple and easy to use, with no moving parts. It stands on its own and is easy to use and simple to store. Product promotes your natural balance and rapidly increases your balance confidence. Cane naturally draws you forward and increases your feelings of safety through consistent contact on any surface. It offers height adjustments from 31" to 40". The Lifetime tru-motion walking cane gives a feeling of security and stability through consistent contact on any surface and encourages correct posture for an upright, confident gait. The innovative style and design of the cane facilitates a natural, full-range cadence, giving you consistent, reliable feedback to increase your mobility and confidence in your walking pattern. The cane easily adjusts to different height settings from 31" to 40" and can rotate to both left and right handed positions to accommodate all users. The curved foot of the Lifetime Tru-motion cane provides greater surface contact with the ground ensuring a solid, stable foundation no matter the angle. When the user is able to apply their natural, full-range walking pattern, it results in less energy expenditure and facilitates a healthy, upright gait. Height adjustments from 31" to 40"
View YouTube Video "Lifetime Tru-Motion Walking Cane"
Pros:"Stands up on its own","Looks good" Bottom Line:Yes, I would recommend this to a friend. I bought a Lifetime cane for my father-in-lawâ€¦ he's very anti-caneâ€¦ He has a four-point cane, and a walkerâ€¦ but uses neither because they're so bulky and hard to use. He graciously accepted my gift, but later told my wife that he didn't think he needed a cane, and probably wouldn't use it. She kindly reminded him that he's fallen three times in the last two weeks. Each of those times he obviously needed a cane. "It's better that you have it with you and don't need it, than need it and not have it with you." Apparently he took that to heart. Today he sent me the following: "I want to let you know that I like this cane. It evens stands up by itself and stays there. It goes wherever I go just like a puppy, always by your side. Thanks for it." I was told to use my cane by holding it in the hand opposite of the injured side. The demo video shows the opposite. The walker is using the cane in cadence with the foot on the same side. How can I trust a product that is being used incorrectly in the demo video? I bought this for my husband and he is very happy with it. It's sturdy without being bulky. The cane is very substantial and reliable for someone how needs extra help for stability. I would recommend.